This page is a summary of the main features of the Buddhist religion or way of life. I am writing as a non-Buddhist, but I have used Buddhist sources and I have tried to present the teachings fairly. However there are many detailed teachings, and significant variation between different forms of Buddhism, so I have had to try to assess what is most important, and that assessment is subjective. This page covers the life of the Buddha, the essential teachings of Buddhism, other teachings and practices, different types of Buddhism, and modern Buddhism. I conclude with useful references if you want to read more. Buddhism began in what is now India and Nepal, when Siddhartha Gautama (the Buddha, meaning the enlightened one) rejected many of the teachings of the Hindu religion in which he was raised, and was enlightened to see a better way to understand and to live. He spent the rest of his life sharing his teachings with others. The teachings were memorised and passed down, mainly in monasteries, and finally written down several centuries after he died. Siddhartha Gautama (the English spelling can vary) is believed to have been born in 563 BCE. Most historians accept that he was a historical person, but many believe the correct date of birth is about a century or more later. He was born into a royal or governing family and lived his early life in wealth and privilege, sheltered from many of the realities of life for poorer people. But all this changed when he travelled outside the palace where he lived, and saw sickness, ageing and death. This led to him deciding that wealth and luxury was unable to provide happiness, and he left his wealthy life to live as an ascetic, a beggar, and a student of teachers who taught him various forms of meditation and asceticism. However he was dissatisfied with most of what he was taught, and decided that extreme asceticism was as unsatisfactory as wealth and luxury. Finally, after years of study and thought, he gained insight into a Middle Way between the two extremes and is said to have become “enlightened”, now understanding the truth or dhamma. 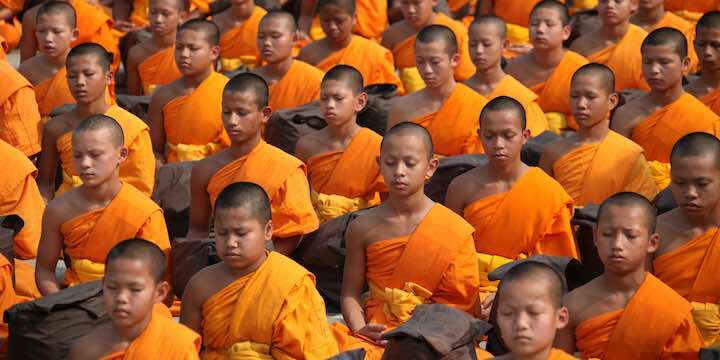 The Buddha’s companions and first converts formed the first sangha or company of Buddhist monks. He and they spent the rest of his life travelling and teaching the truths that he had discovered. He died aged about 80. More a way of life than a religion? The Buddha didn’t teach about God – apparently he thought questions about God were meaningless – and the Buddha is not deified and therefore not supposed to be worshipped. Buddhism has no theology and no doctrines of creation. The Buddha’s teachings are all about understanding life and suffering, living a moral and mindful life, reducing one’s suffering, and attaining peace, understanding and happiness. These outcomes are gained, according to the Buddha, by accepting a set of teachings and following a set of practices laid out in various rules or insights (summarised below). The Buddha – the self-awakened one. Dhamma – the teaching, the nature of reality. Sangha – the awakened community. Life is marred by suffering – e.g. sickness, loneliness, pain, fear, ageing and death. Buddhists summarise this as the three marks of existence – impermanence, suffering and the non-existence of the self (see later). Suffering arises from desire and craving, regardless of what we desire. Whether we receive what we want or not, we won’t be satisfied. Happiness comes from modifying our wanting. Ultimately, our desire for life leads us to be reborn after we die, thus continuing our suffering. Eradicating desire and learning to live one day at a time brings contentment, freedom and release from suffering, which is nirvana (meaning “cessation” – of craving). Attaining nirvana releases the person from the cycle of rebirth. The noble eightfold path leads to the end of suffering. There are many other teachings which are aimed at assisting followers to live a happy and detached life. Here are a few of them. The five skandhas (sometimes called aggregates or degrees of attachment) summarise the Buddhist doctrine of egolessness, the unreality of the self. I have seen this list presented in different orders, under different names, and with different interpretations, apparently because different branches of Buddhism interpret them slightly differently. So we can see it is a complex and difficult teaching for the western mind to understand. The skandhas can be seen as “components that come together to make an individual” and “the five bodily and mental factors that take part in the rise of craving and clinging”. The skandhas contribute to the false sense of self that leads to suffering, and thus Buddhist teaching is aimed at eliminating these skandhas from the Buddhist’s life. Form or matter – something material that can be sensed. Sensation or feeling – the experience of the external world via our senses or mind, in pleasure or pain, which leads to desire and suffering. Perception – the ability to conceptualise and categorise. Mental formation – attitudes, biases, prejudices, interests and attractions. Consciousness – awareness, built on the other skandhas. I found this is one of the strangest and most difficult to grasp ideas in Buddhism. It is a list of 12 elements or states of mind, each arising from and dependent on the previous element, that lead to craving and hence suffering and rebirth. The list seems to duplicate and expand on the 5 skandhas, and some experts believe it is a composite list based on earlier lists. There is a positive and reverse version of this list, showing how enlightenment can be reached by a chain of attitudes where each also depends on the previous. This is sometimes described as “transcendental dependent arising”. Meditation is simply the practice of training the mind. There are different types of meditation, but the main aims might be to increase mindfulness (awareness of self, body, feelings and thoughts), to calm the mind, to gain insight, or to develop positive mental states. All this is seen as an aid to understanding and following Buddhist teachings and reaching the goal of enlightenment. Buddhists may attend temples or become monks to increase their ability to meditate and to follow the eightfold path. Abstain from killing living beings or act with loving-kindness. Abstain from taking that which is not given or be open hearted and generous. Abstain from sexual misconduct or practice stillness, simplicity and contentment. Abstain from false speech or speak with truth, clarity and peace. Abstain from distilled substances that confuse the mind (alcohol and drugs) or live with mindfulness. There are so many more: the 4 sublime or uplifted states, the 5 powers or spiritual faculties, the 10 paramita, the 5 hindrances and the 4 bases or frames of reference of mindfulness. Each lays out some characteristics or ways of thinking and behaving that are seen as helpful or unhelpful. Karma literally means “action”, and in Buddhism refers to the intentions and effects of our actions. According to Buddhism, our destiny is affected by whether we have accumulated good or bad karma. The Buddha taught that we are all caught up in a cycle of rebirth so, unless we achieve enlightenment, when we die we are reborn. We can be reborn into one of six realms, three lower realms (animal, hungry ghost, hell) and three higher realms (jealous gods, demi-gods and human). Only the human realm is on earth, and only the human realm allows the possibility of enlightenment. The ultimate goal of Buddhism is nirvana, literally “quenching” or “cessation”, and refers to the extinction of the 3 poisons and extinguishing of self and craving. Nirvana can be achieved on earth when one becomes enlightened, and is liberated from the cycle of rebirth. As far as I can understand, this means the cessation of self. However apparently some traditions say that enlightened ones (Buddhas) can choose to be reborn so they can assist others to reach enlightenment. Some modern Buddhists, especially in the west, consider its principles to only apply to this life, and do not believe in the cycle of rebirth. Therevada – the oldest and most traditional form, with an emphasis on mindfulness meditation to become fully awakened – mostly in Southeast Asia. Mahayana – the largest school, less strict, with an emphasis on the path of the bodhisattva (returning in rebirth to assist all beings to achieve buddhahood – mostly in northern Asia. Vajrayana (Tibetan) Buddhism – emphasises the use of tantras, or specific spiritual techniques to help individuals gain enlightenment quickly. But there are many variations within these types, within different countries, and in schools such as Zen and Chan. In the two and a half millennia since the Buddha lived, his teachings have been adapted and developed in various ways by the different forms of Buddhism in different countries. It seems to me that the Buddha’s original teachings were stringent and required strong discipline to follow, and most of the changes and developments have softened them a little. I think this is particularly so as Buddhism has become popular among a small but growing group in some western countries. Modern western Buddhism tends to downplay the more “supernatural” elements such as the cycle of rebirth, the six realms, enlightenment and nirvana – presumably these ideas don’t sit well with the modern western scientific mind. Western Buddhism is more “secular”, with an emphasis on meditation and mindfulness as a key to a life of happiness and peace. This makes modern western Buddhism a far more comfortable belief and practice than the Buddha’s original teachings and no doubt contributes to its growing popularity. On the other hand, Buddhism in some countries has become syncretised with other beliefs, even with folk religion and superstition, so that some of the Buddha’s lofty ideals seem to have been lost. For example, elements of Confucianism, Taoism, Buddhism and folk religions have been mixed together to form what may be loosely termed “Chinese religion”, which doesn’t seem to require the same discipline as the Buddha recommended. As a broad generalisation, eastern religions are very different to western religions. The western religions most readers would be familiar with (Christianity, Islam, Judaism, Baha’i, etc) are built around belief in and worship of a creator God, and an emphasis on right doctrine and particular behaviours, whereas eastern religions tend to be more about how to live, with belief and doctrine about gods and spirits much more eclectic. Thus western religions are much more interested in proofs or demonstrations of God – the classic theistic proofs were developed in the west by Greek, Muslim and Christian philosophers – while eastern religions tend to be less interested in these aspects, and accept many supernatural ideas without the sort of evidence that a westerner might seek. They are more interested in what works for them. But Buddhism is different even from other eastern religions. In its original form at least, it has no interest in the question of God or gods, and its teachings were very different to the supernatural beliefs and many gods of Hinduism, the religion the Buddha would have been most familiar with in his youth. It seems to be a much more austere, organised and people-focused religion than Hinduism. It does share with Hinduism a belief in rebirth, but Hindu reincarnation is not exactly the same as Buddhist rebirth. In its modern western form, Buddhism can easily coexist with other worldviews, and a theist or an atheist could reasonably take on the meditation and mindfulness practices of Buddhism without much difficulty – and some do. But the original Buddhism of the Buddha stands against western monotheistic religions just as it stands against Hinduism. As a christian, I have a lot of respect for the Buddha. He seems to have been a person of integrity and insight who faced a genuine problem of how to live in a world of suffering, and delivered some thoughtful answers. However his belief in rebirth, the six realms and enlightenment seem to me to be unsupported by any evidence and contrary to reason, and not believable to me. Secular Buddhist Association on Secular Buddhism, on Meditation and on What is Dependent Arising? How western Buddhism has changed in 50 years. Vishvapani Blomfield in the Guardian (2012). 10 facts about 12 major religions and A summary of world religions on this site.